Vote Tripling is a two-phase voter turnout tactic that nudges people to get three friends to vote. Phase 1—RECRUIT: Ask supporter if you can count on them to hold 3 friends accountable to vote. As part of this ask, the “Vote Tripler” shares their cell phone number and the first names of the three friends they will urge to vote. 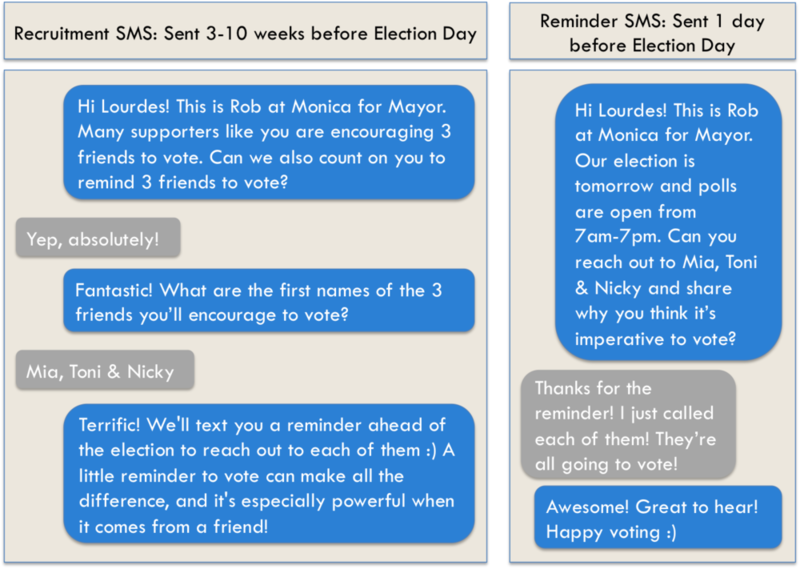 Phase 2—REMIND: Before Election Day, the Vote Tripler receives a text message from the campaign thanking them for encouraging their friends to vote and reminding them of the names of the people they pledged to mobilize. People are accustomed to political campaigns asking them to do things they just don’t want to do. Vote Tripling is different. There’s nothing simpler than being asked to encourage the politically-likeminded people you talk to everyday to vote. Many campaigns asks are extractive (give me your time, give me your money) and most get-out-the-vote tactics “widen disparities in participation by mobilizing high-propensity individuals more than the under-represented, low-propensity citizens.” We believe Vote Tripling is different. If you come from a social network of high-propensity voters, you’re less likely to have inconsistent voters to Triple. However, if you come from an under-represented, low-voting-propensity community, it’s more likely that all three of the people you Triple may be in need of the nudge. Plus, research finds social mobilization messages from disengaged people may be doubly potent because they elicit the perception that if inactive folks are participating, everyone must be involved.